The cylinder dipole can be used as an indoor HF antenna, with VHF/UHF dimensions. 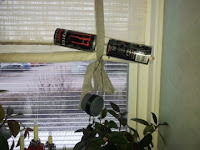 Our test showed that the cylinder dipole constructed from aluminium energy drink cans can be used as a multi-band antenna on 10 m to 15 m.
In the weekend of the ARRL 10 meter contest, Alex SA5BFZ and I (PA1B) made CW QSO's on 10 meter both with our indoor cylinder dipoles. Alex operated on Sunday, outside of the contest. He made 2 excellent QSO's from Sweden with Spain on 10 meter and a QSO with Russia on 17 m. Alex used the cylinder dipole that consists of two 500 ml energy drink cans and a coil of 80 mm with 8 or 9 turns. The photo shows the cylinder dipole of Alex. I participated on Saturday and Sunday for two very short periods in the ARRL 10 meter contest. 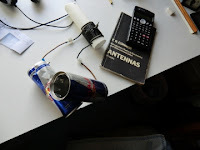 I was curious what my Red Bull antenna would do on 10 meters. I never had the opportunity, to use it before on 10 m, due to the lack of propagation on 10 meters. I worked 2 stations on both days, within 8 minutes and within 5 minutes. With only 10 meter to operate, I was fully depending on the propagation on this band. My cylinder dipole with Red Bull cans is doing fine. The signals must be S8 or stronger, then it is easy to make a QSO. In 3 QSO's I used 2.7 W. In the QSO with RU6AV I used just 0.8 W.
I used a cylinder dipole with two Red Bull cans and a coil of 40 mm with 14 turns. Both cylinder dipoles of Alex and me are doing fine on 10 meters. We made QSO's over large distances within Europe, with low power. The table below shows both call signs of our QRP stations and the stations that we worked, the distance in Miles and the used power in watt. We both operated with the lowest possible power. We reduce our power according the reading of the S-meter before we answer a CQ. To use the lowest possible power we must use S&P. Because we both used the lowest possible power, it is possible to compare the QSO's. The QSO's can be compared by calculating the value of the Miles/quare root of the power or by calculating the Electrical field strength at the receive antenna. In the last column I compare the QSO's in dB. The higher the value in dB, the stronger the signal. I choose my QSO with RN3GQ to be 0 dB. The other QSO's on 10 m are made under better conditions. The value in dB shows the influences of the propagation and the antenna of the other station. The higher the value in dB, the stronger the signal. 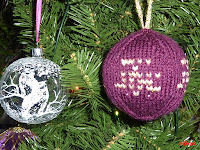 I say Thanks to URQRP.org for the link from their interesting site to this Blog entry. The calculation of Miles per Watt can not be used to compare QSO's. To double the distance we need more power. The power must be increased 4x to get the same signal strength. The value Miles/SQRT(watt) is calculated from the distance in miles divide by the square root of the power in watt. This value is very easy to calculate and is an excellent propagation indicator. P = used power in watt. R = distance between the radio stations in meter. An other way to compare is to calculate the Electrical field strength E.
The lower the Field strength the less power is needed to cover the distance, the better is the propagation. When I use the lowest possible power, I don't call CQ myself. I answer a CQ of stations with strong signals, with a power that is about strong enough to be heard. When my signal is not heard I increase the power with a step of 3 dB, until my signal is heard and the QSO is made. I use the PA1B Fast and accurate attenuator to reduce the power below 360 milliwatt. When the S-meter goes up, my power goes down. 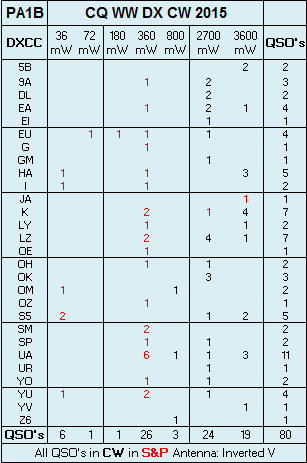 Here is an overview of DXCC countries, that I worked in the CQ WW DX CW contest 2015. On Sunday conditions were much better. Then I used 36 mW to 3.6 W, using the lowest possible power from QSO to QSO. In this contest I used the inverted V.
The values in red are QSO's, that were made with more than 1000 Miles per Watt. 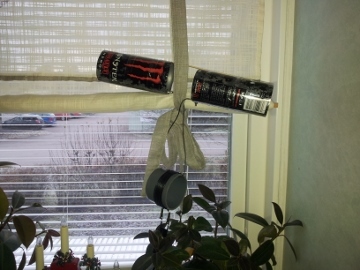 Alex SA5BFZ built his version of the cylinder dipole with 500 ml monster cans. Before building this antenna, Alex asked by email information on several details of the cylinder dipole. 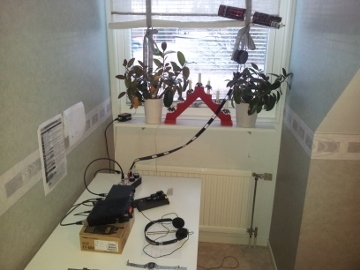 With the information Alex was able to build the antenna and operated with good results on 10 m and 17 m.
In the photo you can see that the dipole is attached to the curtain. The cylinder dipole consists of two cans and a coil. I advised Alex use open cans. So he removed the top and the bottom of the cans. Thanks for the info. I removed the top and bottom of the cans as you suggested. I did some playing around with the antenna this evening. It tunes beautifully 30 - 10 m.
I will try it more seriously in the weekend, when I have some daylight available. If I make one single QSO with the antenna, I will keep it as a trophy. Hi hi. 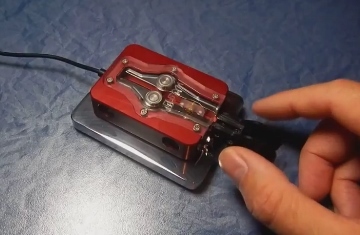 The dipole is connected to the tuner with a ribbon. Last Sunday Alex had some time to test the dipole. Yes very fun indeed! I still can't understand how they could hear me. Hi hi. Alex managed to make two QSO's over a large distance to Spain with QRP with the cylinder dipole. The first contact with EF5Y was made over a distance of 1688 miles or 2717 km. The QSO with EF7X was made with a power of 500 mW over a distance of 1848 Miles and is good for 3696 Miles per Watt. The QSO with UE25R on 17 m was made over a distance of 785 Miles. This QSO on 17 m shows the cylinder dipole, can be used as a multi band antenna. The band is changed, simply by adjusting the tuner on the band of interest. It looks like the indoor cylinder dipole, can be useful in situations with antenna restrictions. Thank you Alex for testing the cylinder dipole, sharing the results and the beautiful pictures. 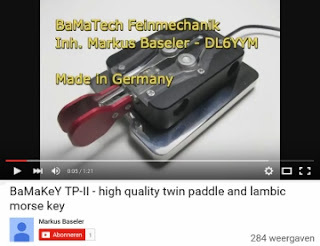 Markus DL6YYM emailed my, to show his high quality twin paddle key that he produces in his small company. 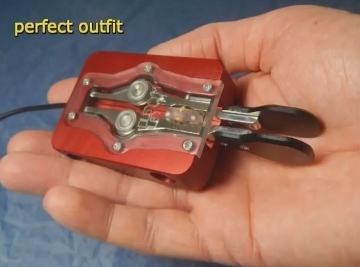 The video gives a good impression of the design and operation of the key. Optional available is a brass chrome plated magnetic base brass chrome plated. 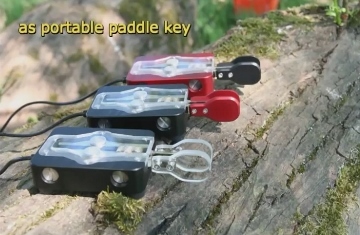 With this magnetic base the portable paddle key can be used as your station paddle key. Strong magnets hold the travel paddle connected to the base. WOW, Markus. I am impressed. It's a beautiful design. On Thursday before the contest, a fellow HAM helped my to repair the inverted V. The whether was sunny with no wind, so it was nice to work on the roof. We replaced a part of the ribbon, where it was broken and we checked the connections in the top of the V.
I decided to repair the inverted V, in stead of using the 15 inch cylinder dipole. The dimensions of the cylinder dipole and it's height 4 m above the ground, allow the antenna work on frequencies of 21 MHz and higher. But now I wanted to use 21 MHz, 14 MHz and 7 MHz. It was great. On Saturday I could make a total of 24 QSO's, all with S&P. The inverted V was working very well. Most QSO's were with European stations on 40 m, 20 m and 15 m. Later I made 4 QSO's with North America. In all the QSO's on Saturday I needed the full power of the FT-817, which is 3,6 W on 20 m and 2,7 W on 40 m and 15 m. That I needed "full power", was only a matter of propagation. On Sunday morning I immediately noticed that the propagation was better. The signal were stronger than on Saturday. After about 10 QSO's with 2.7 W, the signals became stronger. The S-meter went up, so I could make QSO's with 360 mW. In the first QSO with 36 mW the received signal was S9 + 10 dB. This QSO was a DUPE, but I took my change and really enjoyed that OM7M gave a report, so we made the QSO with QRPpp. I very much enjoy this friendly attitude. After this QSO, I came on a quiet part of the 20 m band and I made QSO's all over Europe and two QSO's with North America all with just 360 mW. Then I heard a station from Japan. Luckily it was very quiet on the band (20 m) and with the 3th call, the QSO was made with 3.6 W. I did not dare to go lower. The next 30 QSO were made all over Europe, with 360 mW, except when I needed 3,6 W. When the signals incidentally went up to S9 + 10 dB, it was possible to reduce to 36 mW. It was great. I very much enjoyed to work with the lowest possible power from QSO to QSO on Sunday.